2019 marks 40 Years of Second Chance Animal Rescue! View our events tab to find out more details of how be will be celebrating and fundraising! Second Chance Animal Rescue, registered charity no. 1002511, is based in Southampton. We are a small rescue that deals with dogs, cats, small animals, and wildlife. We have a dedicated team of volunteers that enable us to help as many animals as we possibly can. For over 30 years we have been helping animals find new homes that they can be happy in, but as always, there are more animals that need help than there are homes. Some of the many things we do here are: - to hand-raise orphaned animals, and in the case of wildlife, release them back into the wild when they are old enough; vaccinate and microchip all animals for rehoming, and treat any illness or injury of the animals in our care. On this website, you can find out more about which animals are in desperate need of loving homes. 2 adorable labradors who need a home together.Both 4 years old siblings. She is still awaiting spaying but he is already neutered. They need a spacious maybe rural home. In 2019 it will be 40 years since Second Chance first opened its doors to unwanted, abandoned, stray and needy animals. Sue and George Long, both sadly no longer with us, started the rescue in September 1979 and their son Tony is our present chairperson. Many thousands of animals have passed through our doors to have a second chance at finding their forever homes since then. We want to celebrate 2019 with our supporters by taking on as many (at least 40) fundraising events as we can possibly fit in. So 2019 is promising to be a very exciting year and we would love to invite our supporters to help by finding ways to fundraise for us. Our aim is to raise money for a new roof covering over our outside cattery area and some much needed repairs to our isolation. Hopefully together we can achieve this. If you have any ideas or want to volunteer as a fund-raiser please let us know. Any events will be advertised on our Facebook and website, plus forthcoming newsletters (you may have already seen the events for our two dog walks in January). A list of the events we have arranged so far can be found under Events on our website. 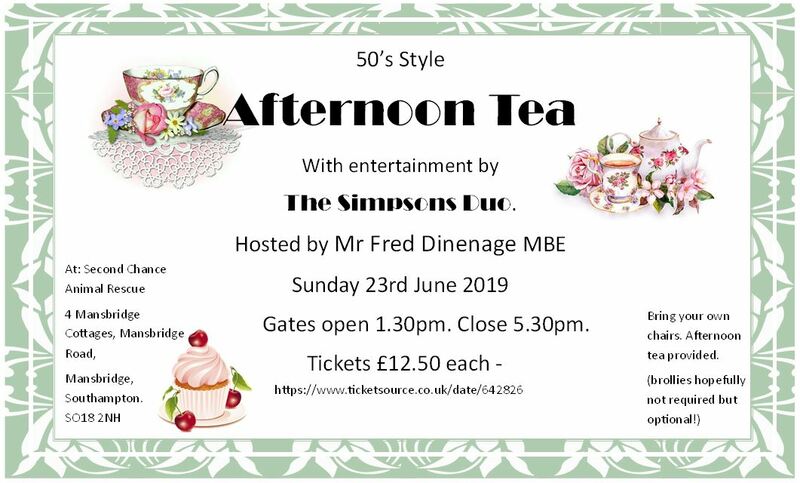 On Sunday 23rd June, we will be holding a 50's Style Afternoon Tea as one of our 40 fundraising events. There will be music entertainment from The Simpsons Duo and the event will be hosted by our patron Fred Dinenage MBE!